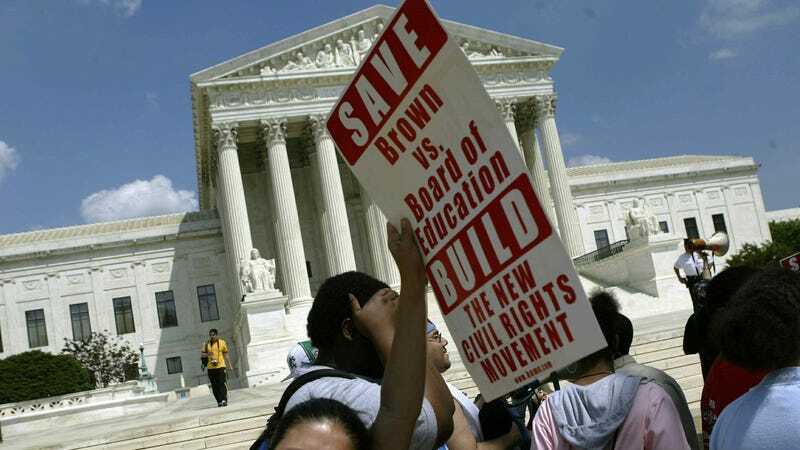 Activists organized by BAMN (By Any Means Necessary) rally in front of the US Supreme Court to mark the anniversary of the Brown vs Board of Education decision May 15, 2004 in Washington, DC. The Supreme Court deemed school segregation unconstitutional more than 60 years ago, but school districts across America are still profoundly segregated: A new report by education research and advocacy group EdBuild has found that white school districts are getting $23 billion more than nonwhite school districts across the country. Using data on school demographics and district funding from the Education Department and the U.S. Census Bureau, EdBuild looked at the nation’s 13,000 public school districts, of which nearly 60 percent (7,600) are more than 75 percent of white, and 9 percent are at least 75 percent nonwhite. “For every student enrolled, the average nonwhite school district receives $2,226 less than a white school district,” the report concludes. (The analysis doesn’t include federal dollars, which, as the Washington Post notes, go to the poorest communities). Interestingly, the two groups have about the same number of students, but majority nonwhite districts encompassed much larger areas than the majority white districts, which were more concentrated. Why is this happening? The short answer is: Decades of segregation (duh), compounded by the fact that most public school districts are funded by property taxes, and white communities are wealthier (due to institutional racism, duh). “Because our system relies so heavily on community wealth, this gap reflects both the prosperity divide in our country and the fragmented nature of school district borders, designed to exclude outside students and protect internal advantage,” the report finds.